When I was in high school I was an assistant in a kindergarten class. I remember having to teach the students how to brush their teeth. I had a huge toothbrush and a model of teeth and we sang a song about teeth having four sides. When I first meet a puppy or kitten I like to discuss dental care with their new pet-parent. Sadly, I don’t have a song to sing about brushing pets’ teeth. For years I’ve discussed the basics, brushing teeth and dental diets. But there are many other options available, but not all products are equal. 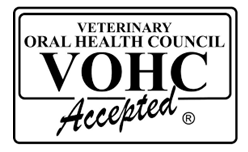 There is a group of board-certified veterinary dentists that test products and if the product meets their standards, it earns the VOHC (Veterinary Oral Health Council) seal of acceptance. Their full list can be found at www.VOHC.org. The best home care option is still brushing teeth. A lot of my clients are intimidated by brushing teeth, thinking the expectation is to brush with similar frequency as we brush our teeth. It’s not necessary to brush twice daily, I’m happy if my patients get their teeth brushed a couple times a week. Never use human toothpaste with fluoride, our pets shouldn’t ingest fluoride. Also, dogs and cats hate foaming toothpaste, even if it is fun to make your dog look like Cujo, he will run from you the second time you try to use that paste. Meat or malt flavored enzymatic toothpaste is the best option. I don’t like the toothbrushes made for pets, I usually use just gauze around my finger, a soft infant finger brush or a child size soft brush. We all feed our pets, so I like that dental diets do not require additional work. It takes more than just being a dry food to be VOHC accepted. The shape, fiber content, and texture of the kibble has to promote chewing and maximize contact with the teeth. Just like kibble, there are multiple options when it comes to dental chews. There are soluble chews that remove plaque and tartar mechanically. There are dental chews that contain an anti-plaque agent, delmopinol, which decreases attachment of plaque to the teeth. There are also rawhide chews that have a disinfectant, chlorhexidine, in them. Remember, you want to monitor your pet when introducing a new chew to make sure they don’t have any problems eating them. Speaking of objects to chew, a board-certified veterinary dentist once told me, don’t feed your dog anything you don’t want to be hit in the knee with. This means all those spare parts the pet stores sell, bones, antlers, hooves, etc., aren’t good for your dog’s teeth or digestive tract. The primary cause of broken teeth in dogs is chewing on something hard. I’ve recently become a fan of dental wipes; it seems to be one of the easiest ways to get owners to step into the home dental care ring. Just wrap the wipe around your finger and rub your pet’s teeth. Here’s a hint, start with the surface of the tooth next to the lip, that is where most pets have problems. If you want to get a gold star, get the inside surfaces of the teeth. But I’m ecstatic to hear my patients are getting any home care. There are other products on the list including water additives, sealants and cleansing gels. With so many options, there is something to fit every pet’s lifestyle. I like to see pets two weeks after their dental cleaning to discuss home care options that are appropriate for them. Think about it, if we never brushed our teeth between dental cleanings, every 6 months would be way too long between cleanings and our dentist wouldn’t give us prizes anymore for good checkups! And as my mom always says, an ounce of prevention is worth a pound of cure. Dental home care can decrease the frequency and severity of dental prophys your pet needs. Contact me with any input, questions or comments, d[email protected]. Check out our web page wildernessvet.com, and our Facebook page. It was great seeing everyone at the Farmers’ Market on Seahawks day. We loved handing out the football magnets, and everyone loved them. We might have a few left, stop by the hospital to pick one up. Finally, remember with the holidays approaching, be careful with candy and treats, keep them out of reach of your pets.